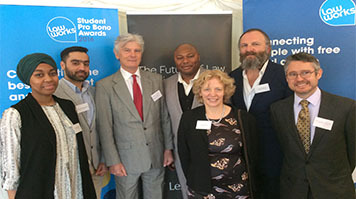 UPDATE: LSBU’s team was highly commended in the category ‘Best Contribution by a Law School’ by Attorney General Jeremy Wright MP at the tenth annual LawWorks and Attorney General's Student Pro Bono Awards ceremony. Student Clinic Volunteer and a third-year law student Claire Bradford said: “I have really enjoyed volunteering at the Legal Advice Clinic this term. The high-profile national awards recognise outstanding contributions by universities and students in the provision of pro bono (free) legal work for their local communities. The Legal Advice Clinic offers free face-to-face legal advice to the local community in all areas of social welfare law and specialist advice in housing, employment and family, and has helped more than 2000 clients since it opened in September 2011. The Clinic is staffed by 41 law student volunteers who are supervised by several university-employed practising lawyers. The Clinic is also supported by solicitors at local law firms, Philcox Gray, Wainwright Cummins and Anthony Gold. The Lambeth County Court Help Desk is staffed by 48 law student volunteers and 10 law student volunteers work on Street Law. These projects are also supported and supervised by lawyers in the Law Division. The Law Division will go up against 5 other universities in the same category, and The Attorney General, Jeremy Wright QC MP, will present the awards to the winning students at a ceremony being held at the Terrace Pavilion, House of Commons on Thursday 28th April. Alan Russell, LSBU's Senior Lecturer in Law Division, said: "We’re very pleased to have been shortlisted for this award. "Our clinical legal education work is already nationally and internationally recognised for its pioneering ‘drop-in’ approach. “To be recognised by the Attorney General & LawWorks is a testament to the fantastic work of all the students, staff and external partners who contribute to all our clinical projects." The Law Division is taking part in the annual London Legal Walk on Monday 16 May 2016 to raise funds for cash strapped Law Centres and other free advice agencies in London, including our own Legal Advice Clinic. Email Alan Russell to get involved or go directly to the fundraising page.